This story comes from our good friend Lynne Robinson at TaoStyle.net! Thanks Lynne! All photographs are by her brilliant collaborator Bill Curry. Tracy Engelien landed in Taos the usual way. Came on a road trip with her boyfriend, fell in love with the landscape and the light, returned to Los Angeles for enough time to pack up their lives. In the few months since they’ve arrived, she’s not wasted a moment getting her business up and running in its first brick-and-mortar incarnation. Her partner is in the music business, so can work remotely, but Tracy decided it was time to dip her toes into retail’s waters. Boxie Tees, Tracy’s wholesale and online store, was already a success so bringing her product into an actual storefront was not a real stretch. The L.A. native, who has a background in Art History, imagined a life in design when she first started out working for a design firm on the West Coast that specialised in Boutique Hotels and Restaurants. When she was laid off during the recession, she went to work for her aunt and uncle, who had owned a successful tee-shirt company for over thirty years. A good thing, because after almost a decade of working for them – learning the ropes from the ground up – when they decided to close unexpectedly, she had a wealth of knowledge at her disposal along with the manufacturer. Boxie Tees was born. Since then she’s built a successful business and brand, while staying true to her mission. 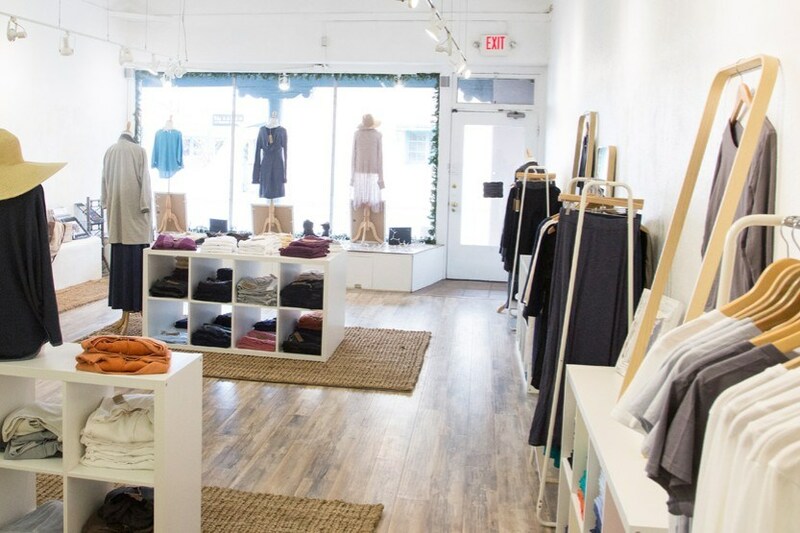 The clothes, which include tunics and pants, cardigans and vests, all made from the same super soft, high-quality jersey knits, and come in yummy, edible colors and relaxed, boxie fits, have that laid-back California vibe that translates well to our region, where the lifestyle is equally relaxed, if not more so. The day I popped in, Rachel Bell from Shank was buying a simple white Tee. “Always on the hunt for the perfect white tee,” we said in stereo. Rachel in fact deserves a whole lot of credit for the hip businesses now lining the strip alongside Shank, in what were empty storefronts for a very long time before she made the brave decision to move her salon from its previous location. Others clearly took note. Looking around the space that Tracy has transformed into a sleek modern and very urban environment, it’s evident her background in design has gifted her with the aesthetic sensibility which informs the clothing line as well. “My core influence is modern design, Bauhaus – form follows function – that philosophy,” she explained. That her father (Mark Engelien) is a retired, accomplished architect, comes as no surprise then. As she tells it, he was delighted to hear she was moving here, and has already visited (he came once years ago to ski and got caught in a blizzard), and made several pen and ink and watercolor illustrations while he was here. Charming signed prints of these works, which really show his architectural drafting skills, are also for sale at Boxie Tees and would make sweet and affordable gifts for almost anyone you know! Tracy stays on top of trends and fashion’s fast moving cycles; she puts out new collections accordingly. 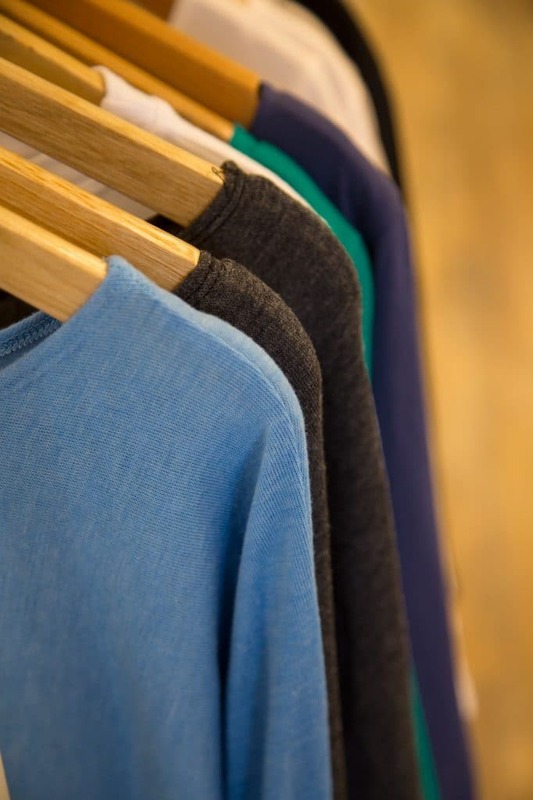 Boxie Basics (always in stock), are made from 100% organic cotton. 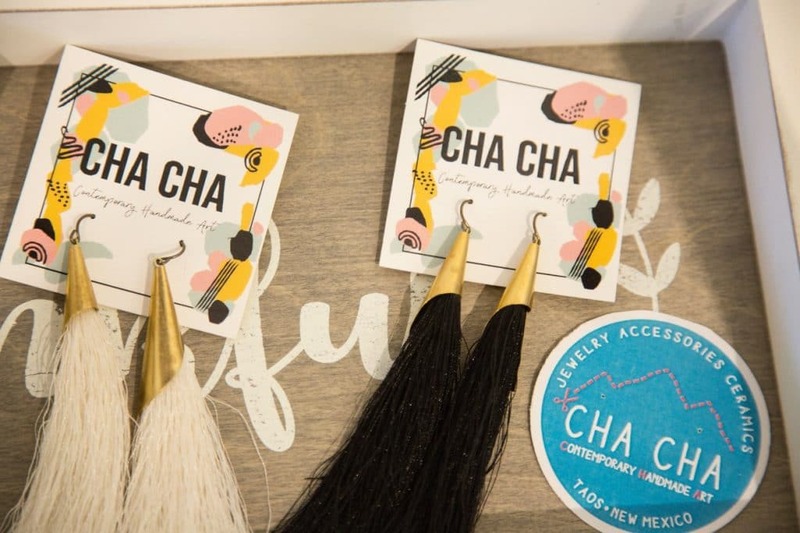 Tracy also carries a locally made line of fun tassel earrings by Cha Cha, that complement the clothes nicely, along with a line of very cool, European boots. She was wearing a pair the day we visited, and plans to expand on the imported shoe and boot offerings in the near future. When Bill Curry arrived to take these photographs, he made a beeline for a pair of soft, wine colored joggers and immediately wanted to know whether she was planning a men’s line? Maybe Taos will inspire that and even more! With loungewear poised to be the biggest trend post the athleisure wave, Tracy is definitely on the cutting edge of what women want to wear right now. For much more on Boxie Tees, drop into their store at 113 Paseo del Pueblo Norte or find them online.